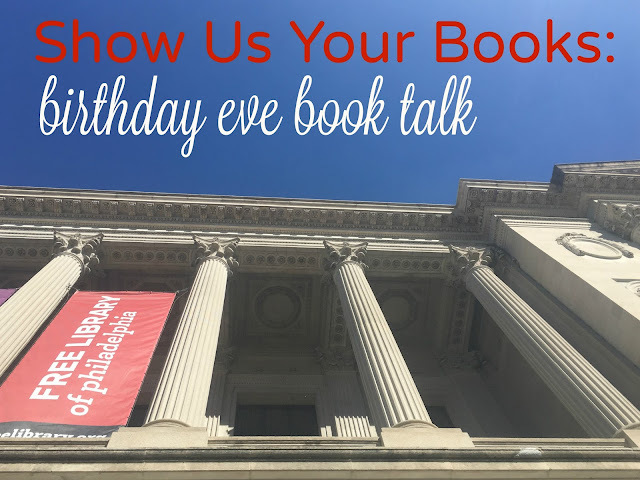 Is there a better way to spend my birthday eve than talking books? No, there is not. Well, I could be talking books from a warm, sunny beach chair under the sheltering shade of a colorful umbrella, but other than that, no. The Seven Husbands of Eveyln Hugo by Taylor Jenkins Reid - I loved this book from start to finish - complicated, interesting, and I loved the story within a story, which I typically don't like. I want to meet Evelyn Hugo and at times I wanted to be Evelyn Hugo because she just storms through her life and that is powerful, even when it leaves earthquakes around her. ARC from Netgalley in exchange for an honest review. Perfectly Undone by Jamie Raintree - This was a three for a while but it blossomed into a four. It shook off some things that annoyed me in the beginning. The characters seemed to settle into themselves and that's when the story gelled. More of a love story than I usually read, but I didn't mind it. Free copy from netgalley in exchange for an honest review. The Loving Husband by Christobel Kent - This book was a mess both in how it was told and the actual story line, which I felt like I had to keep running after and grabbing only to have it fly off again. There were zero characters I could get behind. Free copy from Netgalley in exchange for an honest review. Tell the Truth, Shame the Devil by Melina Marchetta - I loved Saving Francesca and The Piper's Son from jump. The writing and story got me both times. This one, I got about 20 pages in with no click. It could be a great book, but it's not for me and I won't go back to it. So I stayed up since it's a snow day and started watching episodes of Long Island Medium and am on my 3rd one and it's almost 2am! Jmj. So glad it didn't snow when you were born. Wishing all to be safe and sound and keeping the power and that this is the final snow. Well, you know I loved Behind Her Eyes. And the genre line it crossed is one I like but I didn't put a lot of stock into it when it started to drift there, which is why the ending really blew my mind. I had to read the ending and epilogue like three times before I fully got it and then I laughed and laughed and laughed. I also really enjoyed The Life We Bury because I adored Joe and Jeremy. I'm going to try and get an ARC of the TJR book. Fingers crossed. Behind Her Eyes and The Life We Bury are already on my tbr. I added Perfectly Undone and the Nikolas Butler one. I'm a little surprised by your DNF with Melina Marchetta's latest, but it was nothing like previous ones that you enjoyed. I always say that not all books work for all people, and I always find it interesting what works for some and not others. It reinforces our individualities. adding The Life we Bury and it's a miracle! it's even available at my library! ahh so good to hear TJRs new book is a good one, I totally missed it on netgalley (probably for the best, my shelf is out of control). tell the truth shame the devil was in my library pile and i had to renew it several times and just gave up. i'm sure i'll get back to it eventually, maybe, but i have other books of hers i want to read first that sound more like my cup of tea. glad you liked the life we bury! It's still on Netgalley if you didn't request it! I can't wait to read Evelyn Hugo when it comes out since Netgalley didn't approve me...it sounds awesome though, and different than some of her other work! It will be a solid summer read for me, I hope :) The Life We Bury and Behind Her Eyes both sound really engrossing. I am curious about the genre cross - it totally throws me off when that happens in a book and I'm not expecting it, haha. Hmmm I feel like I've seen a LOT about Tell The Truth, Shame the Devil...but I can't decide if sounds worth checking out or not. OH, and HAPPY BIRTHDAY EVE! Thank you for this awesome link-up, it's always enjoyable, so I'm glad you were born ;) Hope you have an amazing day! I'll have to check Behind Her Eyes - I love a book that just surprises me. Hope you are ready to celebrate your day!!! Thanks for doing this link up - I love all the books that I load to my "must read" list every month. I already had The Seven Husbands of Evelyn Hugo and Almost Missed You on TBR list, and after your review, I want them to move up very quickly! Perfectly Undone also sounds like a great book, and I love that it's set in Portland too! It seems like everybody is talking about Behind Her Eyes, so it's definitely going on my list too! Too bad that Perfect Little World was such a dud - I liked The Family Fang. Happy almost birthday!!! I keep hearing about Behind Her Eyes, but conflicting reviews have it kind of low on the reading list. So so excited for that TJR to be widely available to non-NetGalleyers! And definitely interested in Behind Her Eyes and intrigued by a change in genre. oooooh adding behind her eyes to my tbr! Adding Behind Her Eyes and The Life We Bury to my list. I have the new TJR book on my Netgalley shelf waiting for me and after reading what you and Jana said...I'm even more excited to start it!!! Happy Birthday Eve! I'm excited to eventually read The Seven Husbands... though I still need to read One True Loves. Loved your thoughts on Perfect Little World- I've gone back and forth on adding it to my tbr list and will probably skip over it for now. I LOVED Evelyn Hugo. I'm still excited for the Butler even though it's not on the level with Shotgun Lovesongs. The Life We Bury is on my TBR and I think I need to move it to the priority list. Yay for a new TJR book, glad to hear it was a good one! The Seven Husbands sounds interesting - I wish I'd known about it before starting Erin's book challenge. It would have been perfect for the green cover category! I need to read the Seven Husbands for sure. It always amazes me how much you read, so inspiring. I need a snow day (or beach day, even better!) and a public transit commute in my life so I can read more! I'm DYING to read The Seven Husbands of Evelyn Hugo and it can't come out soon enough! I already want to read your 3 loved it books, and you made me want to read them even more! I added Behind Her Eyes to my hold list the second I saw any buzz about it in blogland. I keep seeing The Seven Husbands of Eveyln Hugo pop up on these SUYB posts... I think it's finally time to add it to my TBR list :) HAPPY BIRTHDAY EVE!! I feel like I'm seeing Behind Her Eyes everywhere, I'm going to need to read that one. I've never heard of The Seven Husbands of Evelyn Hugo but it sounds really interesting. I like to read about strong women like that. I didn't know Taylor Jenkins Reid has another book on NetGalley-have to go request that! Haha. Behind Her Eyes sounds really good! Definitely adding it to my list. Behind Her Eyes is already on my to-read list. I am loving Taylor Jenkins Reid and I will be placing this on hold at the library once it's released. Happy birthday eve! Happy birthday! I've never read anything by Taylor Jenkins Reid. Will have to do that soon. First, the important stuff: Happy Birthday!!! The sunny beach sounds wonderful. I wish Behind Her Eyes had been better for me, but I must have liked it because it kept me reading; the bizarre turns threw me for a loop. I've had The Life We Bury in audio for so long and still haven't read it, but I think I need to move it up. I really want to get to Seven Husbands. I love Taylor Jenkins Reid books that I've read. I have heard so much about TJR lately, and I have got to hop on the train!! We are on the same page with alot of these! My favorite this month was hands down Evelyn Hugo- you should read Lillian Boxfish Takes a Walk-it was a BOTM last month- similar and great! I was bored by Lucky Us- it just never really went anywhere. I didn't finish Perfect Little World even though the description really grabbed my attention! Can't beat books on the beach...but a birthday is pretty great too. Happy birthday! And I've been contemplating The Life We Bury, so good to know it's worth a read. 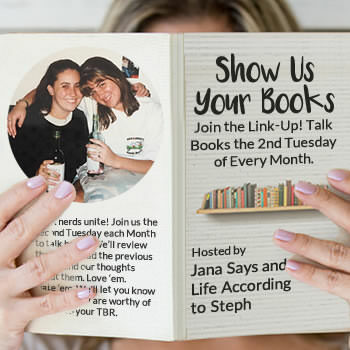 I haven't read any books by Taylor Jenkins Reid yet - I noticed that several bloggers mentioned The Seven Husbands of Evelyn Hugo and After I Do in this month's link-up. Adding these to my list! I couldn't get into Tell the Truth, Shame the Devil either! I'm adding The Seven Husbands of Evelyn Hugo. I've never read Taylor Jenkins Reid, but like five of her books are in my TBR list! Behind Her Eyes sounds interesting. I remember seeing it offered on BOTM and wasn't sure what to think of it but your review has me intrigued. I hope you had a wonderful birthday! I didn't even realize Taylor Jenkins Reid had a new book coming out! So excited to read it! I love how you always have books on your list that I haven't heard of. Because of this link up I have TJR on my list and she is someone who I normally wouldn't gravitate towards. I haven't started Hearts of Men yet but plan on it soon. I know Shotgun will be hard to top. Downloading Behind Her Eyes right now. I need a new thriller. I feel like the TJR book might be Elizabeth-Taylor-ish? If that makes sense. I really want the audio because I LOVE her books on audio. So I'll wait til June. I want it now though. Nicholas Butler has been on my list to read for a while, I just need to buckle down!